I have always had a big soft spot for Lady and the Tramp, Disney’s 1955 tale of the romance that blossoms between the pampered pet dog Lady (Barbara Luddy) and the “footloose and collar free” street mutt Tramp (Larry Roberts). Now the film is being reissued as part of their Signature Collection. Having been in development at the studio for a decade, Lady and the Tramp is notable for being Disney’s first animated feature that wasn’t based on a pre-existing story, allowing them to develop the characters from scratch. The story is filled with many wonderful moments that are still a joy to watch, offering a complete package of comedy, drama, romance and musical. Another one of the things that always strikes me about Lady and the Tramp every time I watch it is just how gorgeous the film looks, especially in its 2.55:1 theatrical aspect ratio, as it is presented here. The first of Disney’s animated features to be shot in CinemaScope – it was made simultaneously in 1.37:1 Academy ratio for theatres that weren’t yet equipped for the larger format – every single scene of the film is beautifully drawn, with the gorgeously painted backgrounds providing a luscious feast for the eyes. What more can I really say about this film? The songs by Sonny Burke and Peggy Lee, including the jazzy “He’s a Tramp,” are classics for a reason. The characters are highly appealing, and I have always found the relationship that forms between Lady and Tramp to be immensely charming, and it of course leads up to that famous spaghetti and meatballs scene, which remains just as heartwarming as it ever was. I have watched Lady and the Tramp countless times over the years, and it’s always a pleasure to revisit it every time I get the chance. The Blu-ray comes with a selection of new and old bonus features. The new stuff includes Walt & His Dogs, a charming piece about the dogs that Disney and his family took in over the years, including one that he gave to his wife in a hatbox for Christmas just like in the film; Stories From Walt’s Office takes us inside his original offices, which were inventoried by a historian following his death and restored to their original form in 2015 with all of his little items and collectibles put back in place; and How to Make a Meatball and Other Fun Facts About Lady and the Tramp features Oh My Disney star Alexus Gabrielle sharing some trivia about the film while teen chef Amber Kelley teaches us how to make a dish of spaghetti and meatballs inspired by that iconic scene. The disc also features the choice to watch the film in Sing-Along Mode, as well as separate sing along versions of the songs, and a selection of bonus features from the Diamond Edition. These include the Inside Walt’s Story Meetings commentary track; the featurette Diane Disney Miller: Remembering Dad; the three deleted scenes Introduction of Boris, Waiting for Baby and Dog Show, which are shown in storyboards and brought to life through voiceover; and the never recorded song “I’m Free As the Breeze,” which was written while the film was in development in 1946, before they decided that Tramp wasn’t going to be a singing character. There’s also a brief preview of the other classic bonus features from the previous releases, which are available when you redeem the digital copy of the film. Although I’m sure most fans already have a copy of Lady and the Tramp in their collections – this is technically my fourth, as I still have the original VHS copy that I got as a kid along with the Platinum and Diamond Editions – this is an attractive release that fits in well with the studio’s other Signature Collection titles. For Disney completists, it’s well worth adding to your collection. 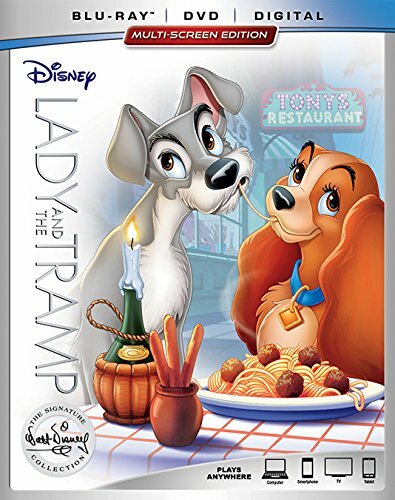 Lady and the Tramp: The Signature Collection is a Disney release. It’s 76 minutes and rated G.